The dramatic arrival of the $993 million spacecraft — designed to listen for quakes and tremors as a way to unveil the Red Planet’s inner mysteries, how it formed billions of years ago and, by extension, how other rocky planets like Earth took shape — marked the eighth successful landing on Mars in NASA’s history. 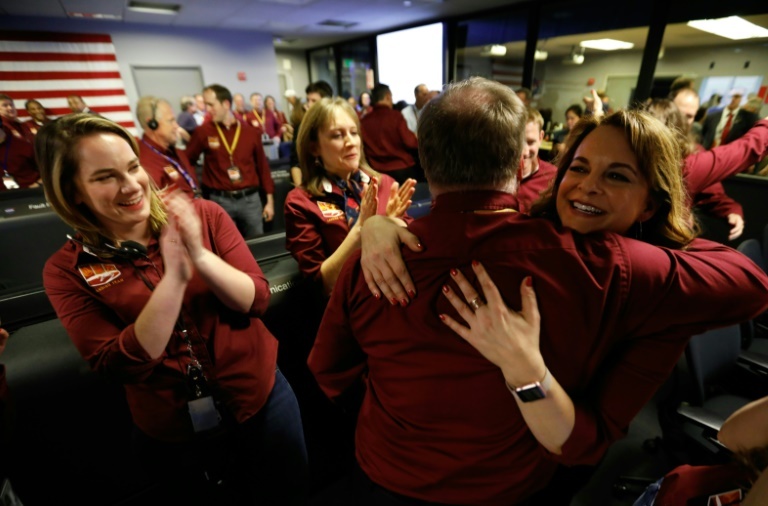 “Touchdown confirmed,” a mission control operator at NASA said, as pent-up anxiety and excitement surged through the room, and dozens of scientists leapt from their seats to embrace each other. “It was intense and you could feel the emotion,” said NASA administrator Jim Bridenstine, in an interview on NASA television afterward. Bridenstine also said President Donald Trump and Vice President Mike Pence had watched on television and called to congratulate the US space agency for its hard work. “Ultimately, the day is coming when we land humans on Mars,” Bridenstine said, adding that the goal is to do so by the mid 2030s. France’s Centre National d’Etudes Spatiales (CNES) made the Seismic Experiment for Interior Structure (SEIS) instrument, the key element for sensing quakes. The principal investigator on the French seismometer, Philippe Lognonne, said he was “relieved and very happy” at the outcome. “I’ve just received confirmation that there are no rocks in front of the lander,” he told AFP. “We never take Mars for granted. Mars is hard,” Thomas Zurbuchen, NASA associate administrator for the science mission directorate, said on Sunday. The nail-biting entry, descent and landing phase began at 11:47 am (1940 GMT) at NASA’s Jet Propulsion Laboratory in Pasadena, California, home to mission control for Mars InSight, and ended one second before 1953 GMT. France’s CNES made the SEIS instrument, while the German Aerospace Center (DLR) provided a self-hammering mole that can burrow 16 feet (five meters) into the surface — farther than any instrument before — to measure heat flow. Spain’s Centro de Astrobiologia made the spacecraft’s wind sensors, and three of InSight’s seismic instruments were designed and built in Britain. Together, the instruments will study geological processes, said Bruce Banerdt, InSight’s principal investigator at the Jet Propulsion Laboratory. By listening for tremors on Mars, whether from quakes or meteor impacts or even volcanic activity, scientists can learn more about its interior and reveal how the planet formed.